Powderpuff is a big, fast-growing shrub that attracts hummingbirds with its puffs of bright blossoms. This is not a plant for small spaces. But if you have room for it, this plant is stunning - and the flowers are frankly adorable. Buds that look just like little berry clusters burst open into fuzzy puffball blossoms. Red is the most commonly available flower color, though there are also varieties with white or pink blooms. The foliage is small-leafed, similar to a northern Mimosa tree, and the free-flowing branches create a pretty, layered look. Butterflies and hummingbirds - and also honeybees - love this plant. Bloom time is on and off year round, though you'll get heavier flowering during warmer months. This shrub works well in a casual landscape - it's not ideal for a more manicured, formal style. And if you don't plan for its size, it can overtake an entire section of garden, with wide-spreading branches and fast-paced growth. This shrub is also available in a single-trunk tree form, or you can snip off bottom shoots to grow your own as a multi-trunk tree. There's also a pretty dwarf variety that can be kept about 3 feet. These shrubs are evergreen and bloom on and off most of the year. They like full to part sun, though they'll do fine in partial shade but won't flower as much. You can keep the plant about 4 to 6 feet tall (and wide) - but it wants to be bigger. It can reach 10 to 15 feet in height, so at some point you may have to let it grow 6 or 8 feet. Large shrubs like these need to be allowed to flush out fully to look good and keeping them smaller can produce a somewhat deformed look. 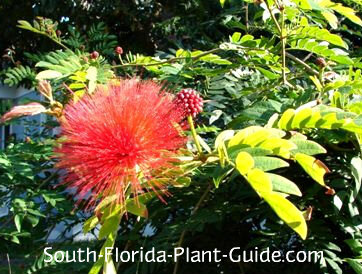 Powderpuffs are cold hardy and can live in Zone 9B and southward. They generally bounce back in spring from any cold damage. Add a combination of top soil (or organic peat moss) and composted cow manure to the hole when you plant. 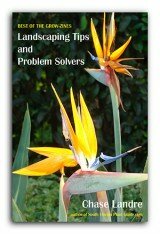 Trim branches rather than using hedge trimmers. 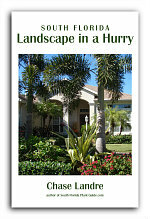 Give the shrub a hard pruning for size in spring (late March or early April). You can do minor shape trimming anytime. Powderpuff is drought tolerant once it's established, but needs water during dry spells It does best with regular irrigation, though, and time to dry out between waterings. Fertilize 3 times a year - in spring, summer, and autumn - with a quality granular fertilizer. You may want to supplement feedings with bone meal and/or liquid fertilizer to promote heavier flowering. For planting along a fence, come out 3 or 4 feet. Allow at least 4 feet (more if you can) between it and nearby plants to keep them from being overwhelmed by powderpuff's wide-spreading branches...and to keep you from having to trim frequently. This plant will work in a large container. 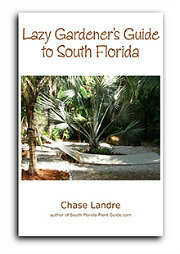 COMPANION PLANT SUGGESTIONS: Plumbago, red fountain grass, hibiscus, Maui ixora, coontie, thryallis, and dwarf clusia.